Some people collect Pokémon cards. Some people play Settlers of Catan. I collect Facebook ads. My favorite is to play a little game called, "Who Are Brands Targeting On Facebook?" However, unlike most people who saw the ad, I’ve spent over $100MM on buying ads on Facebook. For those not in advertising, that’s a lot money to spend on Facebook ads and not a lot people on the planet have my level of experience. Not a humble brag, a brag brag. Virtually all of the money I’ve spent on Facebook was to get people to buy something or sign up for something, and I have been successful enough to start a company that focuses on doing this for some small and Fortune 100 companies. Not surprisingly, when I saw Donald Trump’s ad, I felt compelled to reverse engineer his targeting and see what he was up to. Note #1: Any post about politics is inherently divisive, so I will try to make this as objective as possible in terms of marketing on Facebook. An effective ad is designed to get whomever it’s targeting to take an action by speaking that target's language. In this post, I’m going to focus on the targeting, and in part two of this series, we'll take an objective look at the imagery and ad copy. Note #2: Parscale is Trump’s Agency of Record (AOR), but I know from a personal source that they were subcontracting out the digital media buying on Facebook pre election to another digital marketing agency in New York. I don’t think Parscale runs these ads, as they are not a performance marketing company. Meaning, they focus on brand building and not media buying. When we break the URL apart, we learn a lot more about the target. All of these utm’s track different elements, and we can spot this by the naming convention in the URL. This most certainly means they are running this ad on Desktop placement, which would would make, sense given how long the landing page is. This is paid post and not an organic post. “20171121” - The date they probably created the campaign and/or it went live. “tmagacpros-creative23” - Judging by the “creative23” it looks like they made at least 23 different ads. This likely references the video in the ad, not the ad copy itself. I’m not sure what the “cpros” stands for, but my hunch is that it’s the internal name of the initiative and/or the contractor who made the ad. "q42017” - They’re probably testing this type of survey every quarter. “audience7” - They are likely running “saved” audiences and/or multiple audiences (targeting grouped together). It could be a reference to a Custom Audience, but given the other targeting information in the URL tag, probably not. It could also be for reporting purposes, as performance marketing firms like ours match URL data to other performance data and this helps automate that process. “copy9” - They’re testing at least 9 variations of ad copy. If you combine this with creative23, you would have 9 X 23 = 207 ad variations. Generally speaking, this would be a lot of ad variations for testing a Survey quarterly. “ocpmycr” - OCPM refers to part of their Optimization and Ad Delivery settings, and OCPM is Optimized for CPM (cost per thousand impressions). This means they want to show the ads to as many people as possible for the cheapest amount. The ‘ycr’ could be a reference to several things, but I would guess that it’s a reference to the Campaign Objective they are running, Conversions. If you have a guess or know, please message me and let me know. “us-b-21-65” - The demographics are United States, “b” is both genders, age range is 21-65. This likely means any age over 21; even though it says 21 - 65, the way Facebook targeting is set up, 65 means 64 and up. It’s most likely any age over 64, as that’s where Facebook allows you to target by age range (over 64 years old) instead of an exact age (ie 31 years old). I looked at the comments, likes, and shares on the ad and saw a mix of age ranges, locations in the US, and genders, which would support, but not guarantee, that I am correct. “Nfd-all" - Probably Newsfeed targeting as a placement and all devices. This is a little redundant given the source tag, but normal by marketing standards, it and could be used to help automate reporting. “llp03_donaldtrump_tmagac” - This means it’s the 3rd landing page of any number of landing pages. Remember, it's wise to test multiple landing pages to accomplish your digital marketing goals, so they’re not doing the bare minimum. 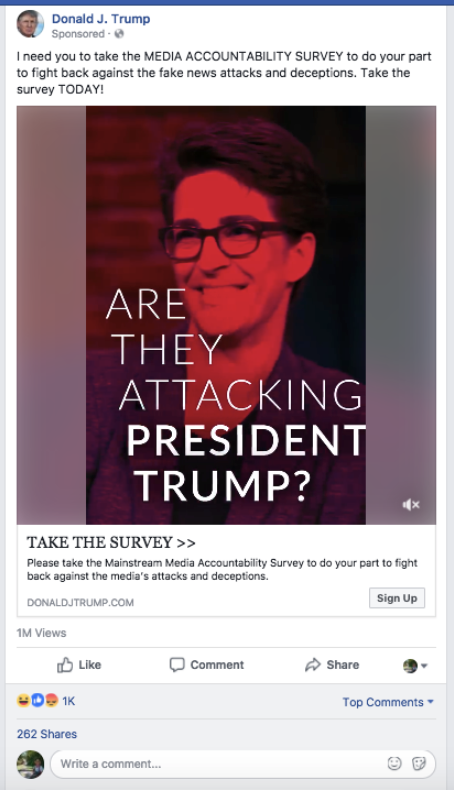 “utm_content=gop_surveys” - The type of test they are running, in this case, is a survey. The llp03 tag indicates there are more surveys, so this probably helps them track how the ad data is working at a higher level in their reporting. There is a lot of context around targeting that I can’t know from this ad URL, but generally speaking, they’re running an above average level of testing on the content they are running while keeping the target broad (high reach). Trump's team is most likely using this strategy to assess which of their audiences within their targeting (gender, age range, where they live, etc.) are responding to which creative, in the most cost efficient manner. Using Facebook Insights (an advertising tool from Facebook) and Google Analytics, they are able to see data on people who respond and complete the ad, such as where they live, purchase behaviors, where they get their news, income, etc. That's a wrap for part one. For the next post in our series, we'll take an objective look at the imagery and ad copy. If you have any further questions or comments on the URL structure or would like to discuss this in greater detail, feel free to leave a comment or Email me directly at Kevin@MetricDigital.com. 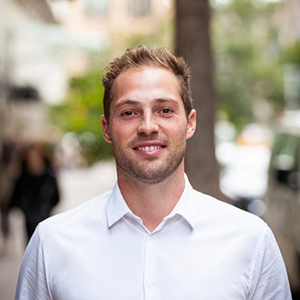 Kevin Simonson is the CEO of Metric Digital, a performance marketing agency in New York City that focuses on driving revenue and customers through online advertising; and consulting Private Equity and VC Firms on due diligence and digital marketing execution. Kevin has lectured on Facebook marketing at Harvard’s Kennedy School and General Assembly. For speaking engagements or business opportunities, please email hello@metricdigital.com. The ROI of Structure, Part 1: Optimizing Your Paid Search Campaigns If companies don't structure their ad accounts the correct way, it can hurt how well they can track and optimize performance down the road. Not to mention, wasting millions of dollars. Facebook Ads Over the Past Decade Kevin and John offer information handy to new advertisers about Facebook ads, and how they have evolved and changed over the past decade. How We Audit Ecommerce Email Marketing Programs We share our approach to audit the quality of a client's email marketing program.